Order Flow Analysis provides a clear view on the market liquidity and its dynamics. It uncovers a behavior of large traders and their further intentions to future price. 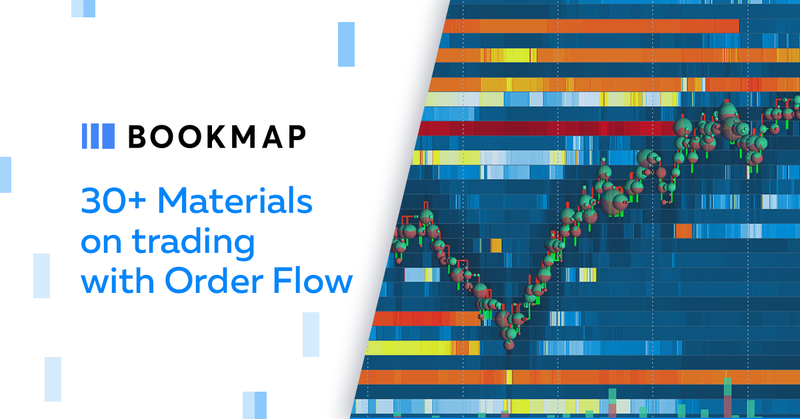 Many futures and stock traders are using the Bookmap trading platform as the primary tool for this analysis method. And as a result, they have an unbeaten edge over other traders. In this article, we have collected useful articles, guides, reviews and expert interviews. They will help you to understand the functionality of the Bookmap platform and its practical application in real trading. Market Mechanics. A detailed explanation of how markets work. The best way to understand the market is to start from the intensive on Market Mechanics. This article doesn’t require any background knowledge about trading. You can apply information from it to the various markets. If you want to learn the way the market works from scratch, start from this. Is trading a Zero-Sum game? Who to deal with and who to avoid within the market and why every good trading strategy is a temporary opportunity? Go through this article to understand it all. If you are a trader, you might control the risks and emotions. It doesn’t matter how extensive your experience is. This FAQ-article will answer why your trading strategy will work worse if you do not change it. Also, how to protect your money with SL and TP and does the Martingale Strategy actually work. You might be already trading futures. There is a list of services to improve your trading skills. It will make the information you receive more accurate. There is a list of futures brokers and trading platforms, useful applications, news resources, top influencers, and forums. This is a list of valuable information sources, divided into five parts. It includes fundamental and technical analysis, trading stocks, trading futures, blockchain and cryptocurrency, and bonus part. Doesn’t matter, what do you trade, you’ll find something special. Tsachi Galanos explains in details how the idea of creating the Bookmap platform arose, as well as its main differences from the other platforms. After reading this article, you will understand what lies behind the usual price charts, what is Order Flow and its importance in trading. A structured and easy-to-understand guide to getting started with the platform. You will find out how to create and configure a connection to a broker or a data provider. Additionally, you will know how to work with the main features of the platform and use it correctly in trading. This video list contains brief guides on how to connect the Bookmap to the data providers. It includes the instructions of connection to the Ninja Trader, TT API, CQG, Rithmic, Multiple Feeds, and others. These tutorials will guide you through the process from scratch. So if you need a brief and proper explanation, click on the link above. Not sure how some functional works? No problem, this guide will give a clear explanation about all platform features. This playlist contains more than 30 video reviews for each feature and component of the platform. You will learn how Iceberg Detector, Large Tracker, Imbalance indicators are working and how to apply them for real trading. In this wiki article, you will find a clear explanation about Bookmap API, its structure and the link between the modules of the platform. Layer 0 API (L0) allows connecting to the exchanges, trading systems and data vendors that are not supported yet. L1 API provides fast access to the data, implementation of automated trading strategies and recording/exporting market data. L2 API level supports custom visualization. The list of 90+ useful short videos explaining typical patterns, traps, and tricks that large players and market makers use in their daily trading. Learn about the development of reversal formations, the ways used to test the levels before they break through, and how traders are flipping the order book. This article explains the Iceberg Order mechanics in detail. It tells about the traders’ motivation behind them, methods of detection in Bookmap and their relation to the market Absorption. This article provides a lot of visual data that makes the understanding of Iceberg Order mechanics easier. An inspiring interview with a professional futures trader Walter Lesicar who has been trading for over 15 years. During his trading, he relies on the Order Flow Analysis, which allows it to be one step ahead of the rest of the traders. In this interview, Luis goes us through his trading process. He tells how he analyzes the market and makes his trading decisions. Bret Bossenbery is a successful trader who uses Bookmap. He trades about 10 years for now. He is quite sure that the fear and greed are the strongest market-driving forces. He shares his trading strategy, funny episodes from his career and some moments from his life. Read this interview to find out the very best advice for the beginners from Bret Bossenbery! Here Jason Ramus shares his turnkey insights. Ramus shares some insights from his trading strategy and the tools he uses. He believes in Blockchain and holds some cryptocurrencies. He trades small, gain big and teaches others how to do the same. This is the story of the successful trader with profound knowledge in the field. He shares his key insights and the details from the personal life of a successful trader. He shares the knowledge for free in Oil Trading Group with other traders. His trading edge sounds like: «cut the losers short and let the winners run», and these are not the empty words. He opens the mention of this expression up and also tells about three basic entry techniques. Greetings from India! Dean Market profile is a professional trader with 13 years of expertise with the volatile markets. He trades on the NSE, Nifty Banks and Nifty 50. He trades without relying on the traditional patterns, but develop his strategy. Dean Market Profile shares his knowledge with his students from Get The Trading Edge. He teaches how to feel the market, and how to learn in terms of high pressure. Read this interview and find out what is and LCT framework, what are the real trades about and why you should avoid the big news. Morad Askar, known as FT71, is a legend in futures trading. He uses volume profiles, order flow, and high-speed intraday scalping. With these tools, he watches for tradable statistical patterns to follow the auctions. Learn how he prepares for the trading day, how he manages his positions and why he switched from trading stocks to futures trading? This article is full of practical information, tiny tips, and tools that might help you to start the path of a crypto trader. Where to read the news, who from the opinion leaders to follow, where to track stats and which instruments to choose for trading? Read this to know the exact answers. Which projects launch ICO? How to choose a right project and protect yourself from a scam? What profit can be expected from an investment in ICO and what pitfalls can occur during the investing process? All these answers you can find in this article. Crypto markets are growing extensionally and their volatility is huge. This is the reason for big gains and big losses of traders in this field. Crypto market is decentralized, anonymous and has the same transaction rules across the World. Should you invest in the Crypto? It’s up to you, but this article will help you to make a wise decision. Italian scalper Marco who goes under the pseudonymous Twitter name BitScalp will tell how the volume analysis tools (Market Profile / Imbalance in Order Book) helps him in making trading decisions on bitcoin. Koning Karel is a young cryptocurrency trader. He succeeds began from the thought that investing into Ethereum might be a good gamble. He started his career before the cryptocurrency market exploded. He avoids being perfect during the trading session. Why markets make you humble? Find out from Koning Karel. Ferran Font is a professional trader. He has 12 years of experience and Bookmap fits well into his trading strategy. Learn how Ferran Font integrates the Order Flow into his trading style and what does he get from it. There is a lot of practice. The main feature of the FT71 approach is breaking down the market behavior into the statistic patterns. On his webinars, Morad Askar will teach you how to read the market auction with the use of statistics and analysis. John Slazas is a trading veteran and an active Bookmap user. His strategy solution combines quantitative models and behavioral inputs. As a result, this strategy is balanced and systematic. John Slazas pinpoints entries and exits based on the order flow in his strategy. This video was made for those who haven’t already got Bookmap. You will start from the general overview of the interface and basic functions of the platform and then learn about some advanced features. Find out how and where to download Bookmap, where to receive the latest updates of social media. Learn how to trade the US Equities with Data Visualization. Bruce Pringle explains the ways to see the unseen with the visual tools. His explanations are based on the real examples, and you will be able to clearly see the depth of understanding given by the data visualization. If you are a professional trader with vast experience in Order Flow and you want to enhance an efficiency of your deals, watch this video. You will find the live trading process with clear explanations from Bruce Pringle. Open it up to lift your trading level to an advanced one. In this article, we have collected the base of useful materials allowing you to clearly understand Bookmap features and the ways you can successfully use it in practice. Our goal is to serve you with a detailed roadmap for using the platform. Soon we will add some new materials to this article, so we recommend to add it to your browser bookmarks. Follow us on Twitter and Facebook, subscribe to our YouTube channel to receive up-to-date content.